The Italians. Reel off the names of the heroes of Italian cycling and it reads like a Who’s Who of serious heavyweight dopers. Mario Cipollini, Ivan Basso, Danilo di Luca, Francesco Moser, Riccardo Ricco, Emanuele Sella, Michele Scarponi, and of course the great imbiber, Marco Pantani. Let us not forget also Graziano Gasparre, busted for transporting a veritable drugstore about under his skin. Gasparre was busted for amphetamine, EPO, HGH, testosterone and cocaine. If you’re gonna do it proper, Graziano, do it proper! Gasparre: anyone got a straw? Il Campionissimo, the great Fausto Coppi, is the greatest rider in a fine tradition of snorters, poppers and needle heads from the Old Boot, and he wasn’t shy about admitting it. In a TV interview back in the day, he admitted taking ‘la bomba’ [amphetamine] pretty darn regularly. Question: Do cyclists take la bomba? Coppi: Yes, and those who claim otherwise, it’s not worth talking to them about cycling. Coppi: Yes. Whenever it was necessary. Coppi: Almost all the time. There’s no doubt that then that there are some pretty high profile dopers in Italian cycling, and you will often hear people – particularly the English and the Americans – cite the Italians (along with the Spanish) as being the ‘worst for doping’. But is that actually true? In the past few years surely the highest concentration of dopers have come from the English-speaking nations, in particular from the USA. Yeah and that completely justifies driving what has been called ‘the greatest fraud in sporting history’ – and that is even if you believe that guff. “We have to come to accept the fact that we have to start with prevention at the age of 13. The parents and society can have a guarantee that sport will be cleaner, that everyone is racing at the same level, something that’s been questioned for a long time now. I read this and I thought ‘Whoah, those Italians are doping their kids! Is this happening in America, where some very questionable characters still dominate USA Cycling? (If need be, google Steve Johnson or Thom Wiesel or, alternatively, just read this from me. For some real fun though, go read about American juniors being doped way back when by Chris Carmichael – damn, what a GREAT coach he is, deserves every penny of that wonga he sits on…). Is this kind of an early, grassroots prevention plan that they have in Italy being presently undertaken by the UCI? Not that I know of, and certainly wasn’t under Pat MacQuaid. Even if the kids aren’t doping, and let’s hope they aren’t, this is exactly the kind of thing that this sport needs. I know it is terrible and awful to say that we need to test juniors and oh my goodness please let them be kids for just a little while longer but if this is all part of a system that educates them against doping later and means that parents have peace of mind that there kids aren’t going to be thrown to the wolves once they move up the ranks then yes, do it. Italy isn’t shy at taking the lead on anti-doping in other respects either. You may remember that the Italian Olympic Committee (CONI) went after Alejandro Valverde for doping when everyone else was happy to look the other way, it seemed. ‘According to CONI, Valverde has violated section 2.2 of the WADA code, “use or attempted use of a prohibited substance or method.” Note that a ride need not actually use blood doping to violate the WADA code, but only “attempt” to use. The Basso case provide the precedent in this context. If CONI can prove its case, the violation carries a two year suspension. The UCI? Slow to act on a doping case involving a major star? Never! Did the Spanish federation assist CONI in its case in any way? Or at the very least, let them get in with the case unobstructed? No. They rushed to Valverde’s defence, as they did when Alberto Contador tested positive for Clenbuterol. Valverde got a two year ban as a result of this, thank CONI, though he still protests his innocence, as any smart doper will, because fans prefer to be lied to and know it is a lie than to be told the truth as it will mean they’ve been taken for chumps. Still not sure about the claim that Italy is really not as bad as you thought? Let’s move on then to Italian gran fondos and some information provided by Uli Fluhme, director of the Gran Fondo New York (GFNY) series. How so? Well, let’s let Uli explain. 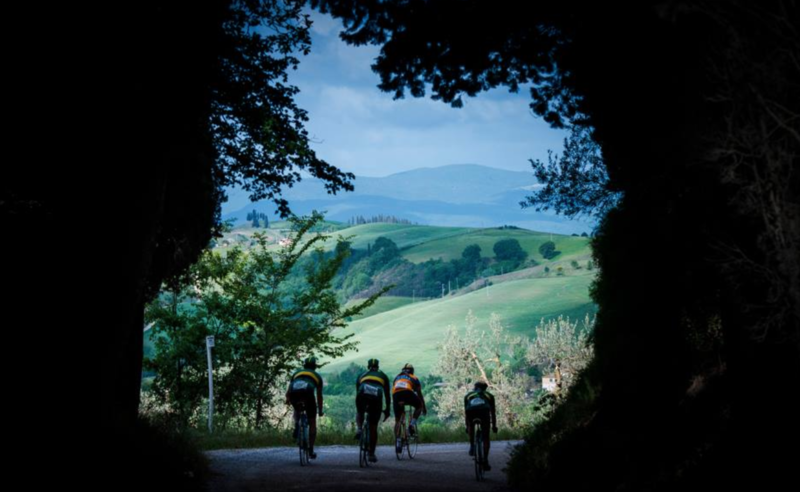 “A Gran Fondo in Italy means racing at the highest amateur level. Anyone who doesn’t make the jump from “dilettante” (elite amateur) to pro at 23/24 years old, races granfondo. Any other kind of masters racing is almost non-existent. “Because cycling is extremely popular in Italy, it is also highly competitive. I’ve raced as an amateur in many countries around the world. Nothing comes close to the level of racing in Italy. While the first granfondo happened in the 70s, the real revolution came in the mid 90s with the introduction of chip timing. “It allowed cyclists to compete in various categories throughout one big peloton. With that kind of competitiveness you get teams, team cars, sponsors, ex-pros – and of course doping. By the late 90s the level of racing at the front was so high that doping was the only explanation. More and more the regular rider and racer got fed up with granfondo superstars that raced like professionals – and doped for it. It’s closer to the truth to say that these guys are doping because the prestige that comes with wining these races – and many are screened live on TV – is massive. You can see a similar trend in the USA in Masters racing. It is not the cash prize that so attracts these guys, but the lure of celebrity. “In 2011,” continues Uli, “under the tutelage of the late Andrea Pinarello (he died of a heart attack at a race, only 40 years old), the Five Stars League was formed. It contained of the 5 most important granfondos in Italy. 2. Pros can ride but not race granfondos. The number of names, the vast majority amateur, here on this list (in fact on the first page alone!) is impressive. “The conclusion,” says Uli, “is not that Italians are all cheaters. The conclusion is that there is testing happening at races and events (Triathlon, Half Marathon, Gran Fondo) where other countries look away. And finally, another notable first that I know of in cycling, the Italian national team management decided back in 2009 to no longer select former dopers for the national team, a decision that saw them clash with the Court of Arbitration in Sport. The British team adhered to this rule until the British Olympic Association rescinded its ban on the selection of former dopers, meaning that David Millar could compete at London 2012. If an athlete cheated in any other way though – for example a marathon runner getting in a taxi at KM12 and getting out ahead of the field again at KM39 – would they be allowed back? What exactly is the difference there? Anyway, I’m wandering. Back to the Italians. ‘Most corrupt’ – not sure how to measure that, but yes, there has been corruption in Italian soccer, cycling and athletics (such as in this case , but do remember Carl Lewis et al before you start spitting feathers), but with all the evidence, noted above, to indicate a real attempt by the Italians to clean up their most beloved sport, can we deny that they are leading the fight against doping in cycling in several major areas any longer? Indeed, Italians are on the front page because they fight doping. Others prefer to look the other way, especially the Spaniards. Imagine Real or Barca getting doping “problems”, too much money there to have it happen. It helped Bartali to know what Coppi took as “medicine” so he we would predict how Coppi might race the following day (or at least that’s how the story goes). There is an issue with amateurs, was at a bike shop, talking to some people and there comes the regular lycra roadie to get some gels. Nothing big, they are useful, instead of carrying 10 sandwiches. And then his pills (I don’t know of which kind) dropped while trying to organize stuff in his carry pouch. Gels, pills all for a day out riding your bike? Come on, do you need to do over 160km at an average of 35km/h? For fun? On the other side, there are so many legal drugs riders take, I mean 75% of the pro-peloton has asthma problems just to get the ok on some drugs. Its no longer needed to take EPO, if you X+Z drugs, you get 80% of the EPO boost. huge issue with amateurs. it’s the ‘trickle-down’ effect. they want to ride the bikes the pros ride, wear the kit the pros kit, and some want to be on the gear *some* pros are on. i recently rode 900km in Mongolia on water and 10 gels over 7 days, felt fine. i do like my extreme endurance for cramping but yeah, it’s getting ridiculous. some guy in the Bahamas got busted earlier this year, the other guys in the racing scene there (which must be very tiny) were like ‘Whoah! Mr. X is fuuuuulyiiiing!’ – then he got busted! i mean really, what is the point. but you know, the allure is the celebrity status of winning, or even of just being the King of the Weekend Ride. not cash. Yes, there is an effect of “copy-paste”, that goes beyond the 10K $ bikes and kits. And again yes, humanity needs better education.